Born in Red Deer, Alberta, Parker Thompson found his love for all things loud and fast at a young age. From motocross to river boat racing, motorsports were a regular part of family life. Parker’s own racing career however, has its beginning at the Calgary Kart Racing Club where he started competition at age eight. Father and son weekends at the track quickly evolved into one of the most successful kart racing careers in Canadian history. By age thirteen, Parker was ranked 3rd in the world and competeting with the likes of Lance Stroll, Lando Norris, Colton Herta and more. At age 14 he left his family in Alberta and joined the Energy Corse Racing Team to challenge the European Title from Italy. Since returning to North America, Thompson has focused on the Road to Indy with the goal of reaching IndyCar. In all the series he has contended, he has repeatedly demonstrated an ability to win. While Thompson remains committed to the goal of reaching IndyCar, his successes, and eagerness to further develop his craft, have created other opportunities in racing. In 2019, Thompson will continue on the Road to Indy, taking on the Indy Pro 2000 Championship. He has also joined the Porsche GT3 Cup Challenge USA with JDX racing. While Thompson has become recognized for his calculated aggressiveness on the racetrack, off the track he is an award-winning road safety advocate. In 2015, after witnessing the devastation caused by distracted driving within his peer group, Thompson founded “Drive to Stay Alive”. 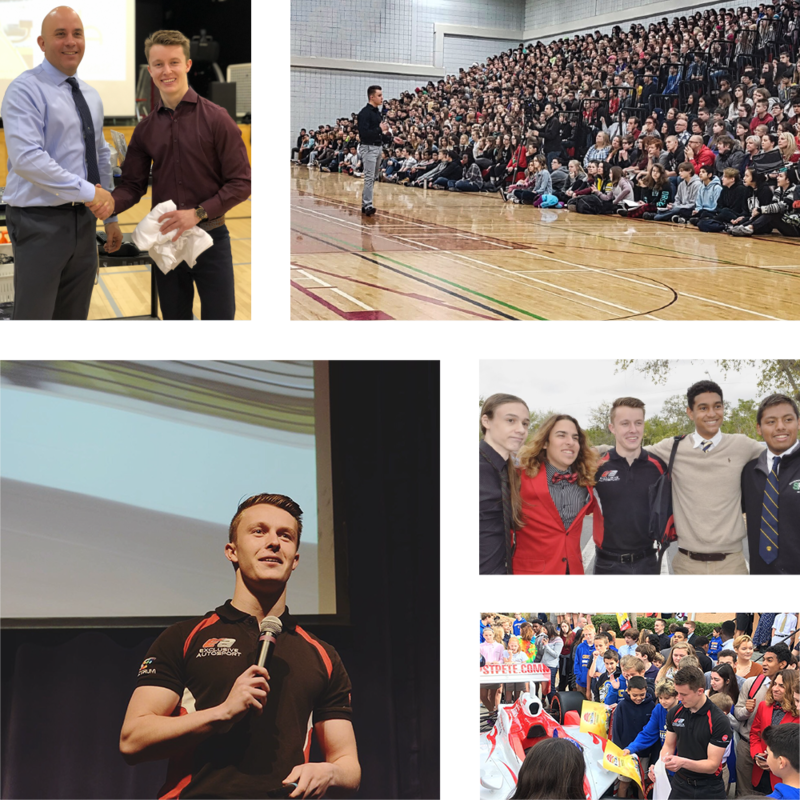 The safe driving campaign utilizes Parker’s unique experiences to connect with high school students and deliver an important message about road safety. Since its inception, the program has presented to more than 100,000 students and 16,000 parents, teachers and transportation industry leaders. Parker Thompson’s presentation to youth on distracted driving is incredibly impactful and motivating. He strikes to the core of the issue with real statistics and anecdotal evidence. He’s definitely saving lives with his message for our youth. While Parker’s career in driving has taken him all over the world, he remains an active member of the Alberta community. Parker is deeply involved with the businesses and organizations that have supported him. He is a talented speaker, and is often engaged through both racing and business to speak at special events. He has even appeared as a guest commentator for other race series. Parker has joined the Abel Motorsports team as they compete for the newly named Indy Pro 2000 Championship. After he finished second in 2018, the only goal is to win the Championship title. For his debut in sports ca racing, Parker teamed up with Colorado’s JDX Racing to drive the #3 JDX Racing / Hertz / Byers Porsche. 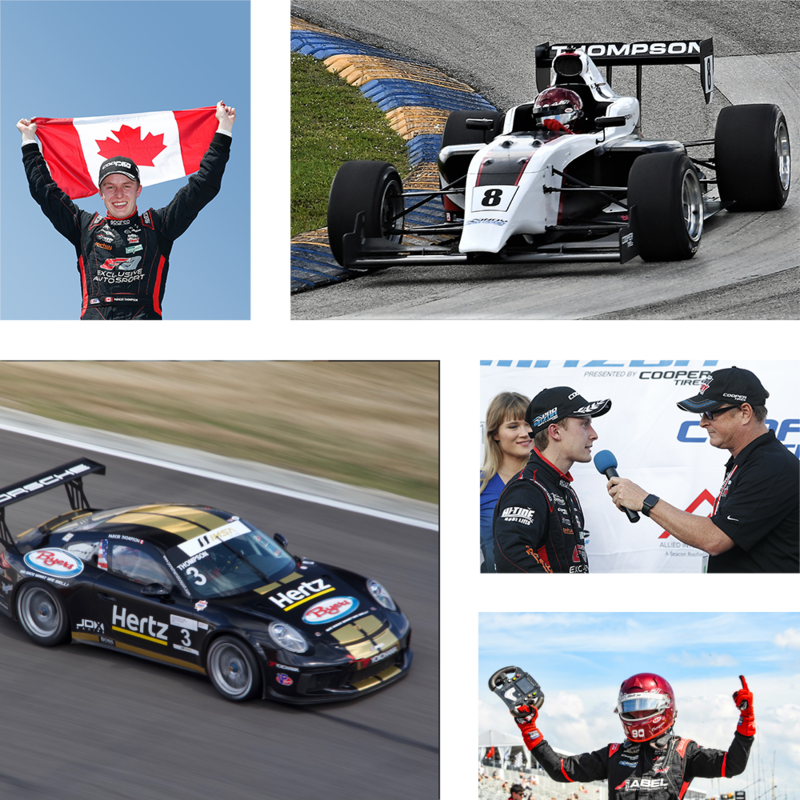 2018 marked the first year in Pro Mazda for both Parker Thompson and team Exclusive Autosport. Winning three out of the first seven races, Thompson took an early lead in the series championship. Late season struggles and mechanical issues caused Thompson to surrender the lead spot with only one race remaining. The final ranking was second place in the overall championship. In his third and final season in the USF2000 series on the Road to Indy, Parker showed great results, winning a total of three races and placing on the podius six times. Having moved straight from karts to the USF2000 series, 2017 was Parker’s first race attempt in an F1600 car. His results were simply outstanding. With seven wins, he set a record for the most wins ever in an F1600 Championship. That translated to a 64% winning percentage. He stood on the podium for all except one race, and in doing so emphatically announced himself as one of Canada’s top racing drivers. Parker’s sophmore year of open-wheel auto racing earned him a Vice Championship in the USF2000 series on the Road to Indy. Racing for Cape Motorsports, he earned four wins and twelve podiums in sixteen races. Parker’s first endeavour in racing outside of karts was on the Road to Indy for the USF2000 Championship. In this highly competitive series, results showed steady improvement. At seasons end, Parker sat in fifth place in championship points.